The fruit-and-cheese lunch takes many forms in my house: a Russet apple and a lump of orange-fleshed Cheshire; a pear with a mild goat cheese; melon with snow-white feta. 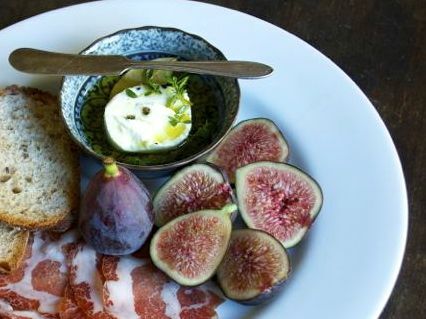 Figs can take the strongest of cheeses, from the saltiest of blues to the most strident of washed-rind varieties. I like them with goat cheeses that have been marinated in oil and aromatics so they take on a more pungent note. They are often brought to the table with slices of coppa or speck, too. Cut the goat cheeses in half horizontally. Put into a large bowl and tuck the herbs and chiles around them. Crack the peppercorns with a heavy object such as a pestle or even a can of something — you just want to split each one into two or three rather than crush them — and add them to the bowl. Pour enough olive oil over the cheeses just to cover them, then cover the bowl tightly with plastic wrap and set aside somewhere cool overnight. The refrigerator will do, but you should bring them out and back to room temperature for a good hour before serving with ripe figs.